Creating a house in the woods - one that literally merges with the scenery - is a lifelong dream for many architects. 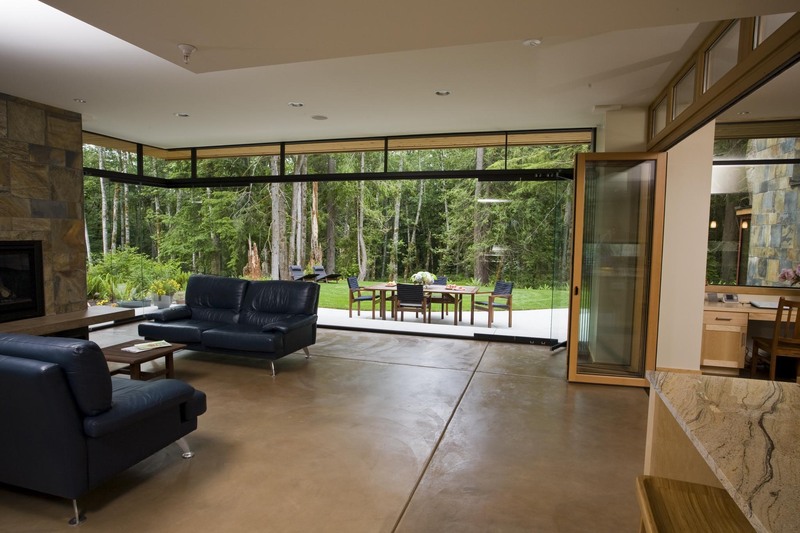 Few achieve this design ideal in the way Gelotte Hommas Architecture has in the lush, rainy highlands of Issaquah, Washington. Though it is just east of Seattle, this soft-modern gem seems worlds away. “This home was designed to interfuse with the gorgeous green Pacific Northwest scenery,” says architect Curtis Gelotte, AIA. 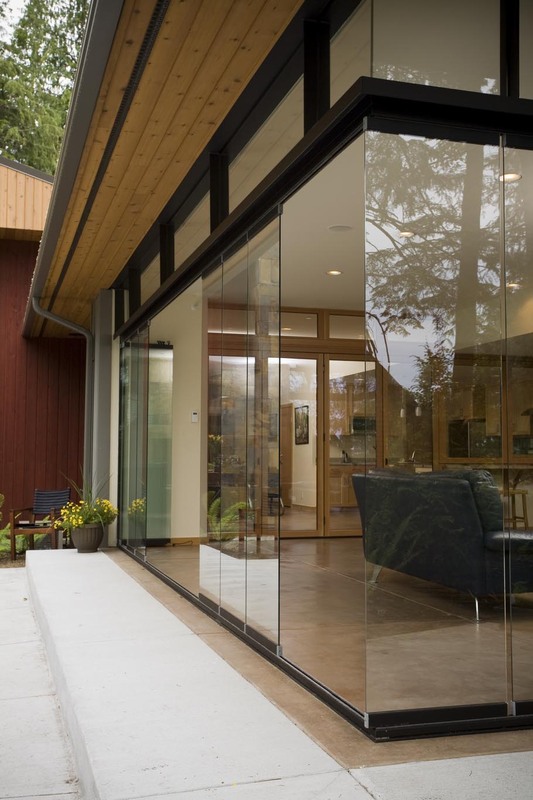 The architect wrapped an ample indoor/outdoor patio with a fully opening NanaWall frameless SL25 system. 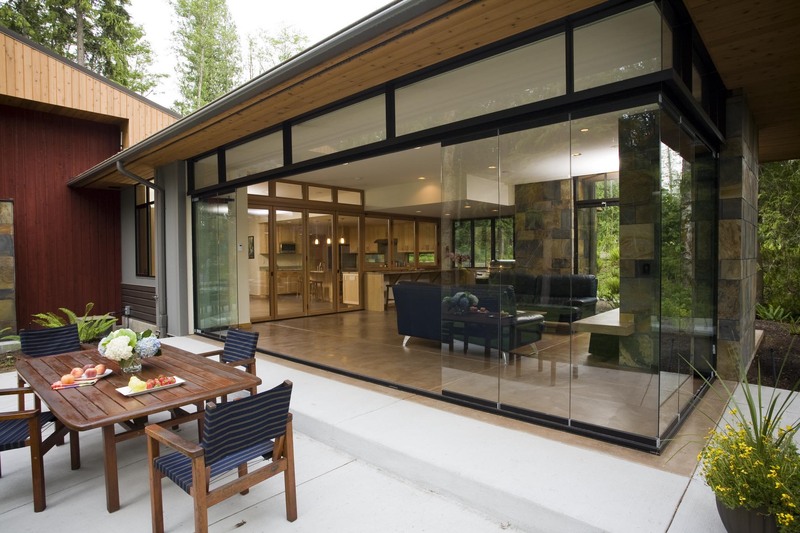 At one end of the patio, a wood-framed folding WD65 window/door combination opens to the kitchen. With seasonable year-round temperatures – and radiant heat underfloor – the family often keeps all the walls open with practically half of their house open to nature. 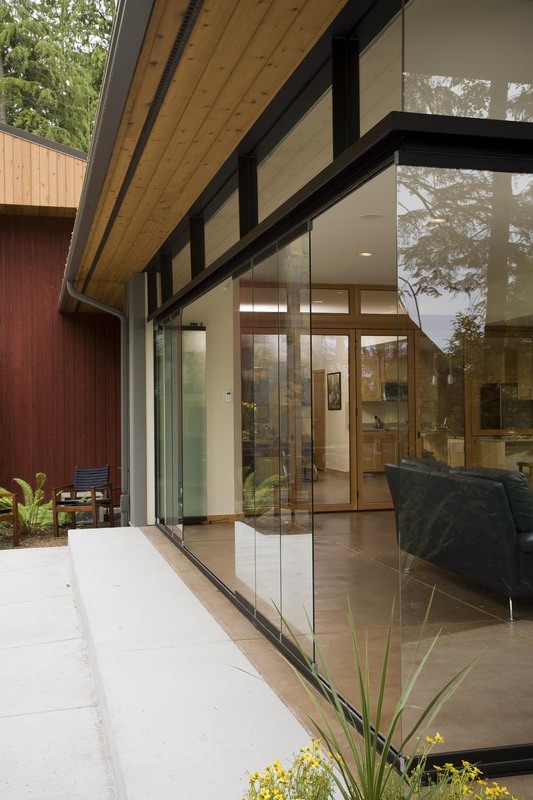 “The most unique feature of this home is the outdoor living area, completely enclosed with the frameless all glass sliding system,” says Gelotte, whose firm recently earned the best architect award from 425 Magazine along with Hilary Young Designs, the interior decorator. 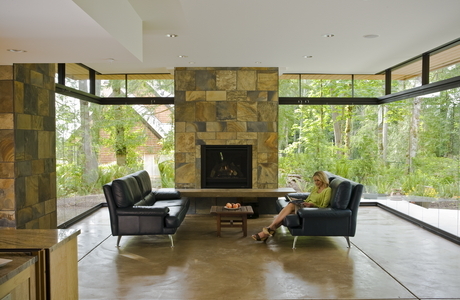 “Come rain or shine, this cozy space doesn’t lose it functionality or usability.” Inside other rooms, the architects used tubular skylights and strategically placed windows to maintain the indoor/outdoor sensibility – “to bring in the natural light and ambiance of the surrounding forest indoors,” Gelotte adds. The combination window/door wall separating the kitchen and patio, with its custom brick pizza oven, is essential to the design concept. With wood frames matching the cabinetry finish, the glass wall extends across the back of the stone kitchen counter and then across a full-height wall area. Retracted to two sides, it brings the family outdoors – even when preparing a meal or seated at the eat-in island counter. 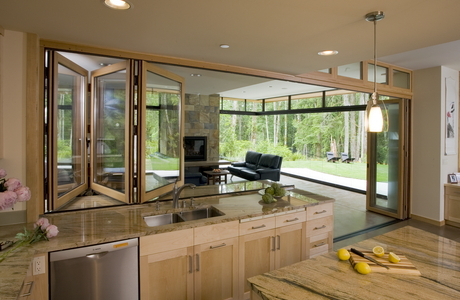 It’s a design move – and a living result – that would be unachievable with any other glass doors or windows. Comfort and lifestyle merge naturally in this house – as they do in many projects by Gelotte Hommas Architecture. One of the reasons is the use of transparency and hidden features, especially for the 634-square-foot covered patio. It has efficient radiant heating on a separate thermostat, for example, and a laundry room that doubles as a mudroom – incorporated to accommodate the family pet. “The Woods Outback is a gem tucked away in the highlands of Issaquah,” says Gelotte, adding that the signature feature is a space that can be completely open when desired. 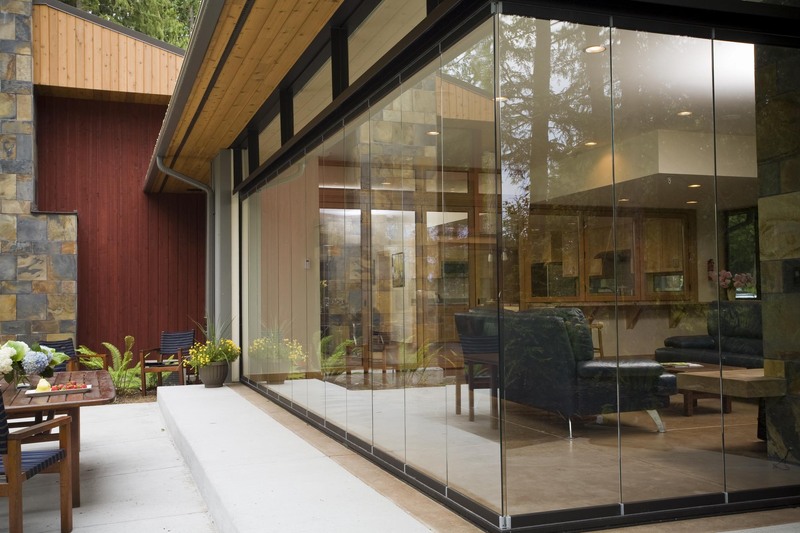 To make it reality, the designers selected three types of NanaWall systems: The top-hung WD65 folding or paired-panel system framed in wood, the WD68F fixed windows, and the NanaGlass SL25, an operable all-glass system with no stiles designed to enclose unconditioned spaces. 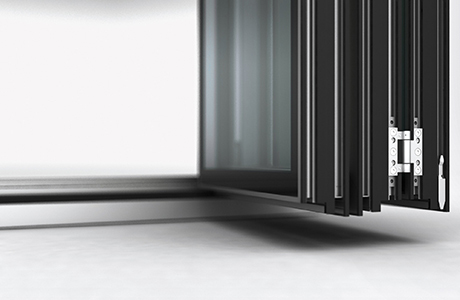 The WD 65 provides an opening glass wall in widths – up to 43 feet, with 12 panels. 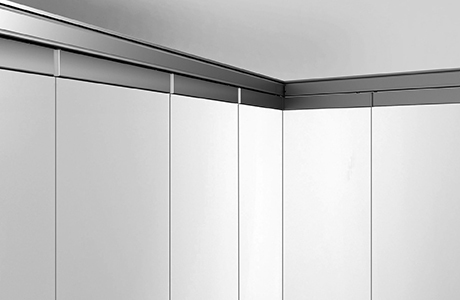 With additional paired panels, virtually unlimited widths are possible. Similarly, the operable all-glass panel systems turn balconies and under-deck spaces into year-round comfortable, habitable areas. Their unique ability to open or close each individual panel allows the family to “tune” their environment exactly as needed. Easy to operate, the panels slide and stack to open the entire space or they close, protecting the space to the outside elements.